Astrocytes (literally ‘star-like cells’) are the most numerous and diverse neuroglial cells in the CNS. While most neuroscientists think they know what an astrocyte is, there is no uniform and unequivocal definition of an astrocyte. Not all astrocytes are star-like cells, not all of them express the specific marker glial fibrillary acidic protein (GFAP), not all contact brain capillaries. Astrocytes are actually the cell population in the brain which are left over after one would remove neurons, oligodendrocytes and microglial cells. Thus astrocytes display a remarkable heterogeneity in their morphology and function. Conceptually astroglial cells are as heterogeneous as neurons and astrocytes in different brain regions may have very different physiological properties. Morphology of astrocytes is highly heterogeneous. Some astrocytes do have a star-like appearance, with several primary (also called stem) processes originating from the soma, although many more morphological profiles exist. An archetypal morphological feature of astrocytes is their expression of intermediate filaments, which form the cytoskeleton. The main types of astroglial intermediate filament proteins are glial fibrillary acidic protein (GFAP) and vimentin; expression of GFAP is commonly used as a specific marker for the identification of astrocytes. It works well in cultured astrocytes, but in situ the levels of GFAP expression vary quite considerably: for example, GFAP is expressed by virtually every Bergmann glial cell in the cerebellum whereas only about 15–20 percent of astrocytes in the cortex of mature animals express GFAP. Protoplasmic astrocytes are present in gray matter. They have many fine processes (approx ~50 µm long), which are extremely elaborate and complex. The processes of protoplasmic astrocytes contact blood vessels, forming so called ‘perivascular’ endfeet, and form multiple contacts with neurones. Some protoplasmic astrocytes also send processes to the pial surface, where they form ‘subpial’ endfeet. Protoplasmic astrocyte density in the cortex varies between 10 000 and 30 000 per mm3; the surface area of their processes (in rodents) may reach up to 60000 - 80 000 µm2, and cover most of neuronal membranes within their reach. Fibrous astrocytes are present in white matter. Their processes are long (up to 300 µm), though much less elaborate as compared to protoplasmic astroglia. The processes of fibrous astrocytes establish several perivascular or subpial endfeet. Fibrous astrocyte processes also send numerous extensions (‘perinodal’ processes) that contact axons at nodes of Ranvier. The density of fibrous astrocytes is ~200 000 cell per mm3. The second big group of astroglial cells are the radial glia, which are bipolar cells each with an ovoid cell body and elongated processes. Radial glia usually have two main processes, one of them forming endfeet at the ventricular wall and the other at the pial surface. Radial glia are a common feature of the developing brain, as they are the first cells to develop from neural progenitors; from very early embryonic stages radial glia also form a scaffold, which assist in neuronal migration. After maturation, radial glia disappear from many brain regions and transform into stellate astrocytes, although radial glial cells remain in the retina (Müller glia) and in lower vertebrates such as turtle. The retina contains specialized radial glia called Müller cells, which make extensive contacts with retinal neurones. The majority of Müller glial cells have a characteristic morphology, extending longitudinal processes along the line of rods and cones. In humans, Müller glial cells occupy up to 20 percent of the overall volume of the retina, and the density of these cells approaches 25 000 per mm2 of retinal surface area. Each Müller cell forms contacts with a clearly defined group of neurons organized in a columnar fashion; a single Müller cell supports ~16 neurones in human retina, and up to 30 in rodents. The cerebellum contains specialized semi-radial glia called Bergmann glia. They have relatively small cell bodies (~15 µm in diameter) and 3 - 6 processes that extend from the Purkinje cell layer to the pial surface. Early in development these cells have contacts to the ventricular surface and are true radial glial cells, but with the development of the granular layer, they acquire the classical morphology of Bergmann glial cells. Usually several (~8 in rodents) Bergmann glial cells surround a single Purkinje neuron and their processes form an ensheathment of the Purkinje cell dendrites. The processes of Bergmann glial cells are extremely elaborated, and they form close contacts with synapses formed by parallel fibres on Purkinje neuron dendrites; each Bergmann glial cell provides coverage for up to 8000 of such synapses. Other regions of the CNS contain many different populations of astroglial cells. Velate astrocytes are found in the cerebellum, where they form a sheath surrounding granule neurones; each velate astrocyte enwraps a single granule neurone. A similar type of astrocyte is also present in the olfactory bulb. Interlaminar astrocytes are specific to the cerebral cortex of higher primates. Their characteristic peculiarity is a very long single process (up to 1 mm) that extends from the soma located within the supragranular layer to cortical layer IV. Tanycytes are specialized astrocytes found in the periventricular organs, the hypophysis and the raphe part of the spinal cord. Astroglial cells in the neuro-hypophysis are known as pituicytes; the processes of these cells surround neuro-secretory axons and axonal endings under resting conditions. Perivascular and marginal astrocytes are localized very close to the pia mater, where they form numerous endfeet with blood vessels; they form the pial and perivascular glia limitans barrier, which assists in isolating the brain parenchyma from the vascular and subarachnoid compartments. Ependymocytes, choroid plexus cells and retinal pigment epithelial cells line the ventricles or the subretinal space. The functions of astroglial cells are many; astrocytes create the brain environment, build up the micro-architecture of the brain parenchyma, maintain brain homeostasis, store and distribute energy substrates, control the development of neural cells, synaptogenesis and synaptic maintenance and provide for brain defence. Neurons and macroglia both originate from neuroepithelial cells. Early in development, neuroepithelial cells transform into the radial glia which now have been recognized as the neural precursor cell. Asymmetric division of radial glia produce neuronal precursors that migrate to their destinations using the processes of the radial glial as a scaffolding guide-line. The radial glia can also act as progenitors (through several transitional forms) for both astrocytes and oligodendrocytes. Some of the astrocytes, localised in the neurogenic niches of the adult brain, retain the stem cell properties throughout the life span and are the source for the adult neuro- and glio-genesis. In addition neuroglial cells are instrumental in promoting neuronal survival at different developmental stages through the release of numerous neurotrophic factors (for example epidermal growth factor, EGF, glial cell-derived neurotrophic factor, GDNF, etc.). In the mammalian brain the astroglial cells define the micro-architecture of the parenchyma by dividing the grey matter (through the process known as “tiling”) into relatively independent structural units. The protoplasmic astrocytes occupy their own territory and create the micro-anatomical domains within the limits of their processes. Within the confines of these anatomical domains the membrane of the astrocyte covers synapses and neuronal membranes, as well as sends processes to plaster the wall of the neighbouring blood vessel with their endfeet. The complex astrocyte-neurons-blood vessel is generally known as a neurovascular unit. The individual astroglial domains are integrated into the superstructure of astroglial syncytia through gap junctions localised on the peripheral processes of astroglial cells. These astroglial syncytia are also anatomically segregated being formed within defined anatomical structures, for example in individual barrels of the somatosensory cortex. Astroglial cells can control extracellular homeostasis in the brain. By virtue of multiple molecular cascades, astrocytes control concentrations of ions, neurotransmitters and metabolites and regulate water movements. An early recognized function of astrocytes is the control of K+ levels in the brain. Neuronal activity leads to an increase in K+ concentration from a resting level of about 3 mM to a maximum of 10 - 12 mM under physiological conditions and to even higher values under pathological conditions. Higher K+ concentration in the extracellular space modulates neuronal activity and the brain has a tendency to keep extracellular K+ levels stable at their resting value. Astrocytes remove excess extracellular K+ by at least two different mechanisms. So called ´spatial buffering´ is a passive mechanism by which K+ is taken up at the site of higher concentration (facilitated by inward rectifier K+ channels), redistributed within the astrocyte or the coupled astrocyte network and released at sites where it is lower. In retinal Müller cells, this process is termed K+ siphoning. Secondly, they can remove extracellular K+ by an increase in pump activities such as the Na+/K+-ATPase activity, leading to an increase in intracellular K+ and water. The glial syncytia and aquaporine channels expressed in astrocytes also play a role in water homeostasis in the brain. Glutamate is the major excitatory neurotransmitter in the brain of vertebrates. When released in excess or for long-time, glutamate acts as a powerful neurotoxin that triggers neuronal cell death in many acute and chronic brain lesions. The glial function to “chemically split or take up” transmitters was predicted by the Italian psychiatrist Ernesto Lugaro in 1907. Astrocytes remove the bulk of glutamate from the extracellular space; they accumulate 80% of the glutamate released, whereas the remaining 20% is taken up by neurons. Astrocytes remove extracellular glutamate by excitatory amino acid transporters (EAAT). Five types of EAATs are present in the human brain; the EAAT1 and EAAT2 are expressed almost exclusively in astrocytes (the rodent analogues are known as glutamate/aspartate transporter, GLAST, and glutamate transporter-1, GLT-1). The glutamate transporters are co-transporters which utilize the energy saved in the form of transmembrane Na+ gradient so that the transport of a single glutamate molecule requires an influx of 3 Na+ ions and 1 H+ ion coupled with the efflux of 1 K+ ion. The substantial sodium accumulation accompanying glutamate accumulation is counterbalanced by Na+ efflux through Na+/Ca2+ exchanger working in the reverse mode; both the Na+/Ca2+ exchanger and glutamate transporters are co-localized in perisynaptic astroglial processes. Astroglial glutamate transport is crucial for neuronal glutamatergic transmission by operating the glutamate–glutamine shuttle. Glutamate, accumulated by astrocytes is enzymatically converted into glutamine by the astrocytic-specific glutamine synthetase. Glutamine is not sensed by neurotransmitter receptors, is not toxic and can be safely transported to presynaptic terminals through the extracellular space; after entering the neuronal compartment glutamine is transformed into glutamate. It is also of importance that astrocytes possess the enzyme pyruvate carboxylase, and thus act as a main source for de novo glutamate synthesis. The astroglial cells are the central elements of the neurovascular units that integrate neural circuitry with local blood flow and metabolic support. The basal lamina of blood vessels is almost entirely covered by astrocyte endfeet. The astrocyte is therefore at a strategic position, with one arm at the blood vessel, with its other at the neuronal membrane, synapse or axon. It can thus be viewed as the neurovascular bridge. Increased activity of neurones triggers Ca2+ signals in astrocytes and this could be the integrating signal for the the neurovascular unit. This astrocyte activity leads to the release of vasoactive agents that regulate the local blood flow. The field is still controversial. Some groups have reported that astrocyte activity leads to a vasoconstriction, while others have observed vasodilatation. But one issue is undisputed: astrocytes are an essential link between neuronal activity and blood flow, which in fact is the readout of magnetic resonance tomography. Moreover, astrocytes are also responsible for local metabolic support of neurons. The postulated glucose-lactate shuttle introduced the concept that astrocytes take up glucose from the blood, convert it to lactate, release it and thus provide an energy substrate to neurons. Interestingly astrocytes are the only cells in the brain which can synthesize glycogen and thus can serve as an energy reservoir. Astroglia regulate formation, maturation, maintenance, and stability of synapses thus controlling the connectivity of neuronal circuits. Astrocytes secrete numerous factors indispensable for synaptogenesis, and without astrocytes, formation of synapses would be greatly depressed. Synaptic formation strictly depends on cholesterol, produced and secreted by astrocytes (that, most likely, provides a building material for new membranes). In addition, cholesterol may be locally converted into steroid hormones, which in turn can act as synaptogenic signals. Glial cells also affect synaptogenesis through signals influencing the expression of a specific protein, agrin, essential for synapse formation. Another signal by which astrocytes control synaptogenesis is thrombin. Subsequently, astrocytes control maturation of synapses through several signalling systems, which affect the postsynaptic density, for example by controlling the density of postsynaptic receptors. Several distinct soluble factors, released from astroglia affect synapse maturation. These include for example tumour necrosis factor alpha (TNF-alpha), which regulates the insertion of glutamate receptors into postsynaptic membranes and activity-dependent neurotrophic factor (ADNF), which, after being secreted by astrocytes, increases the density of NMDA receptors in the membrane of neighbouring postsynaptic neurons. Astrocytes may also limit the number of synapses since astrocyte membranes can ensheath the neuronal processes and thus compete with synapses. Astroglial cells can also be involved in the elimination of synapses in the CNS, the process which underlies the final tuning and plasticity of the neuronal inputs. This may be achieved by secretion of certain factors or proteolytic enzymes, which demolish the extracellular matrix and reduce the stability of the synaptic contact. Subsequently, astroglial processes may enter the synaptic cleft and literally close and substitute the synapse. This process is prominent in pathology. In the gray matter, astrocytes are closely associated with neuronal membranes and specifically with synaptic regions, so that astroglial membranes completely or partially enwrap presynaptic terminals and postsynaptic structures. In the hippocampus, for example, ~60 % of all axon-dendritic synapses are surrounded by astroglial membranes. These astrocyte–synapse contacts show peculiar specificity; astroglial membranes enwrap about 80 % of large perforated synapses (which are probably the most functionally active), whereas only about half of small (known as macular) synapses are covered by glial membranes. In the cerebellum, glial–synaptic relations are even more intimate, as nearly all of the synapses formed by parallel fibres on the dendrites of Purkinje neuron are covered by the membranes of Bergmann glial cells; each individual Bergmann cell enwraps between 2000 and 6000 synaptic contacts. The distance between terminal structures of astrocytes and neuronal pre- and postsynaptic membranes is as close as 1 µm. The very intimate morphological apposition of astrocytes and synaptic structures allow the former to be exposed to the neurotransmitters released from the synaptic terminals. Functionally, the processes of astroglial cells are endowed with neurotransmitter receptors, and most importantly, the modalities of receptors expressed by astroglial membranes precisely match the neurotransmitters released at the synapses they cover. In this respect, astrocytes have a complement of receptors very similar to that of their neuronal neighbour. In the cerebellum, for example, the Purkinje neuron/Bergmann glia pair receives several synaptic inputs, which use as neurotransmitters glutamate, ATP, noradrenalin, histamine and GABA; both neuron and glial cell express receptors specific for these substances. In the cortex, both pyramidal neurons and neighbouring astroglial cells express glutamate and purinoreceptors, whereas in the basal ganglia neurons and astrocytes are sensitive to dopamine. In the ability to sense neurotransmitter release, therefore, the astroglial cell closely resembles the postsynaptic neuron. Close morphological relations between astrocytes and synapses as well as functional expression of relevant receptors in the astroglial cells prompted the concept of the “tripartite synapse”. According to this concept, synapses are built from three equally important parts, the presynaptic terminal, the postsynaptic neuronal membrane and the surrounding astrocyte. A neurotransmitter released from the presynaptic terminal activates receptors in both the postsynaptic neuronal membrane and the perisynaptic astroglial membranes. This results in the generation of a postsynaptic potential in the neuron and a Ca2+ signal in the astrocyte. The latter may propagate through the astroglial cell body or through the astrocytic syncytium; this Ca2+ signal may also trigger release of neurotransmitters from the astrocyte, which in turn will signal onto both pre- and postsynaptic neuronal membranes. The question of whether astrocytes actively participate in the ongoing synaptic transmission remains open. Astroglial signals are on a much slower time scale, rather in the second or even minute range as compared to the rapid signalling of neurons which occurs within milliseconds. Astrocytes therefore can be considered as integrators or modulators. 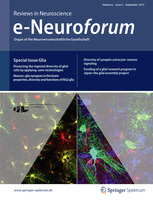 At the same time the intimate coverage of synaptic structures by astroglial membranes can have another important role: the astroglial membranes may effectively isolate synapses and prevent neurotransmitter spillover (e. g. of glutamate and GABA) therefore increasing spatial precison of synaptic transmission. Receptors located in astroglial perisynaptic processes are activated by neurotransmitter released from presynaptic terminals. In certain regions of the brain, astrocytes receive direct synapse-like (synaptoid) or even classical synaptic connections. For example stimulation of pituitary stalk depolarizes stellate astrocyte-like glia, pituicytes, through direct input from neurones forming synaptoid contacts, where axonal projections end on pituicytes. Similarly, norepinephrine terminals make synaptoid contacts onto septohippocampal astrocytes. In cortex, spontaneous “minature” excitatory currents were recorded from astrocytes suggesting a very close apposition of glial membranes to the sites of neurotransmitter release. Astroglial metabotropic receptors are coupled to intracellular signaling cascades, which provide glia with specific excitability mechanisms. The glial excitability, as we perceive it today, is based on the excitability of the endoplasmic reticulum membrane containing Ca2+ release channels, represented by InsP3 receptors and ryanodine receptors. Stimulation of astroglial metabotropic receptors induces formation of InsP3, which in turn triggers Ca2+ release from the ER thus producing Ca2+ signals; these Ca2+ signals are generally associated with glial activation and act as a substrate for glial excitability. Astrocytic Ca2+ signals can cross cell-to-cell boundaries and propagate through astroglial syncytia. Mechanisms of generation and maintenance of intercellular Ca2+ waves are complex and involve InsP3 diffusion through gap junctions as well as exocytotic release of ATP from astrocytes. The gap junctions may also form the pathways for signaling in the astroglial syncytia, which may involve various second messengers, metabolic substrates, and other molecules. We know very little about these alternative pathways, and yet these could be important for the plasticity and information processing by astroglia. Astrocytes and other glial cells can release a variety of transmitters into the extracellular space. These transmitters are currently classified as gliotransmitters although in fact they are the same molecules utilized by neurones such as glutamate, ATP, GABA and D-serine. Only taurine and possibly kinurenic acids may represent substances uniquely released by glia being thus true gliotransmitters. Several different mechanisms have been implicated in the release of a gliotransmitter. These mechanisms include: (i) diffusion through high-permeability channels (e.g. volume-activated Cl- channels, unpaired connexin “hemichannels” or P2X7 pore-forming purinoceptors; (ii) through transporters, e.g. by reversal of excitatory amino acid transporters or exchange via the cystine-glutamate antiporter or organic anion transporters; and (iii) through Ca2+-dependent exocytosis. The first documented description of secretion from astrocytes was made by a French neuroanatomist Jean Nageotte who in 1910 proposed that astroglial cells may release substances into the blood, acting like an endocrine gland. Recently, exocytotic release from astroglial cells was confirmed in numerous experiments. It appeared that astrocytes express proteins important for exocytosis such as synaptobrevin 2, syntaxin 1, synaptosome-associated protein of 23 kDa. In addition, astrocytes express transportes required for neutotransmitter accumulation in the secretory vesicles. These include the vacuolar type of proton ATPase (V-ATPase), which drives protons into the vesicular lumen creating the proton concentration gradient necessary for glutamate/ATP transport into vesicles, and the three known isoforms of vesicular glutamate transporters (VGLUTs) 1, 2 and 3 and vesicular nucleotide transporters (VNUT). Immunoelectron microscopy studies demonstrated that VGLUTs 1 or 2 in astrocytes in situ associate with small clear vesicles with a mean diameter of ~30 nm. Astrocytes also have large dense core granules with diameters of ~115 nm, containing the secretory peptide secretogranin II and ATP. Functionally, exocytotic release of transmitters for astrocytes was deduced from several types of experiments in vitro and in situ. In particular Ca2+-dependent exocytotic glutamate release from astrocytes can trigger several neuronal responses including an elevation of neuronal [Ca2+]i and generation of a slow neuronal inward current mediated by NMDA receptors. In addition glutamate released from astroglia can affect neuronal excitability, possibly modulate synaptic transmission and synchronise synaptic events. It should be stated, however, that the role and relevance of gliotransmission for information processing in the brain remains controversial. The pathological potential of neuroglia was recognised already at the end of the 19th to the beginning of the 20th centuries by prominent neuropathologists such as Carl Frommann, Franz Nissl, Alois Alzheimer and Pio del Rio-Hortega. Nevertheless, the detailed knowledge of the pathological importance of neuroglia in general and astroglia in particular remains fragmentary, because of a long-lasting prevalence of neurocentric views in neurology and neuropathology. Nonetheless not only are astrocytes fundamental for the control of brain homeostasis, they also represent an important part of the intrinsic brain defence system. Brain insults of multiple aetiology trigger an evolutionary conserved astroglial defence response generally referred to as reactive astrogliosis. The astrogliosis is essential for both limiting the areas of damage (by scar formation through anisomorphic astrogliosis) and for the post-insult remodeling and recovery of neural function (by isomorphic astrogliosis). Astrocytes are involved in all types of brain pathologies from acute lesions (trauma or stroke) to chronic neurodegenerative processes (such as Alexander’s disease, Alzheimer’s disease, Parkinson’s disease, multiple sclerosis and many others) and psychiatric diseases. The pathologically relevant neuroglial processes are many, and they include various programmes of activation, which are essential for limiting the areas of damage, producing neuro-immune responses and for the post-insult remodelling and recovery of neural function. Recent studies also emphasised the role of astroglial degeneration and atrophy in the early stages of various neurodegenerative disorders, which may be important for cognitive impairments. All in all astroglial cells determine to a very large extend the progression and the outcome of neurological diseases.